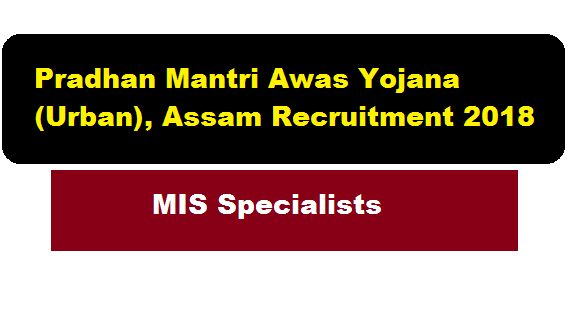 Pradhan Mantri Awas Yojana (Urban), Assam Recruitment 2018 (second) | MIS Specialists Job : Hello everyone ! We are here to inform you about another Recruitment in Pradhan Mantri Awas Yojana (Urban), Assam. Earlier we have published a recruitment notification in the same organization about Municipal Finance Specialists Job in Pradhan Mantri Awas Yojana (Urban), Assam. This time we are going to inform you about second recruitment in PMAY Assam 2018. According to the latest PMAY Assam Second Recruitment 2018, Online applications are invited for Interview or/and Written Test for 13 posts of MIS Specialist in City Level Technical Cell of Pradhan Mantri Awas Yojana (Urban) for engagement on contractual basis. In this section, we will discus in detail about Recruitment of MIS Specialists Posts Under Pradhan Mantri Awas Yojana (Urban),Assam Recruitment 2018 with all the details and requirements . i. Post graduate/graduate/diploma in Computer Science/Electronics or MCA/PGDCA. ii. 3-5 years of work experience in government/semi govt./ autonomous organizations/ private company of repute. iii. Experience in software development and database management. iv. Fluency in local language essential. Interested and eligible candidates may apply online at http://pmayassam.in/ website. Online application will be received till 14th July 2018. 1/ Only shortlisted candidates will be called for Interview or/and Written Test for which no TA/DA will be paid. 2/List of shortlisted candidates will be published in the website http://pmayassam.in before the Interview. 3/No call letters will be sent for attending the Interview or/and Written Test. 4/The candidates should report for Interview or/and Written Test at the scheduled Date/Time and Venue which will be intimated in this website. 5/The candidates should regularly check this website for further information. 6/The candidates should bring their original document/certificates at the time of Interview or/and Written Test for verification.